A sunspot on the sun's eastern limb is crackling with powerful X-class solar flares. Just-numbered AR1748 announced itself during the early hours of May 13th with an X1.7-class eruption (0217 UT), quickly followed by an X2.8-class flare (1609 UT) and an X3.2-class flare (0117 UT on May 14). These are the strongest flares of the year so far, and they signal a significant increase in solar activity. 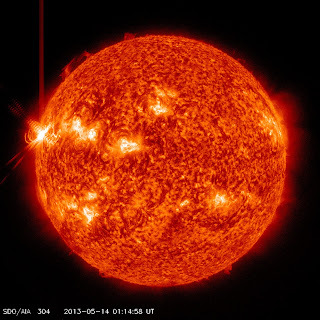 NOAA forecasters estimate a 40% chance of more X-flares during the next 24 hours. 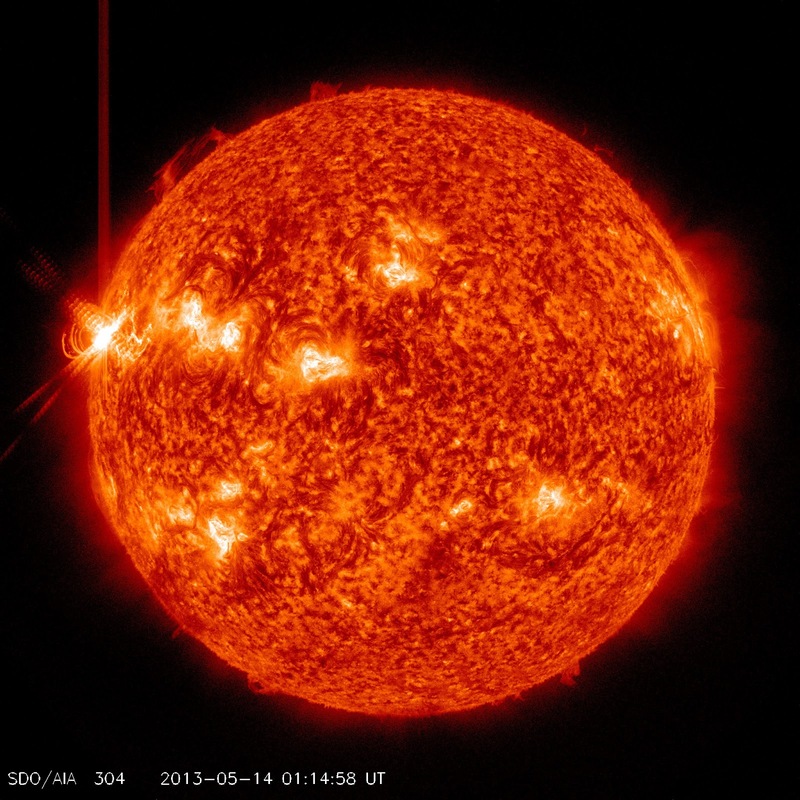 The explosions have also hurled coronal mass ejections (CMEs) into space. Coronagraphs onboard the Solar and Heliospheric Observatory are tracking the clouds: movie. The planet in the CME movie is Mercury. Although the CMEs appear to hit Mercury, they do not. In fact, no planets were in the line of fire. However, the CMEs appear to be on course to hit NASA's Epoxi and Spitzer spacecraft on May 15-16. When the action began on May 13th, the instigating sunspot (just numbered "AR1748") was hidden behind the sun's eastern limb, but now solar rotation is bringing the active region into view.